Home » Stock » How and Where to Buy Google Stock? There might be no need to tell about this company because all know it. This is a steady growing company buying and founding a great number of subsidiaries and services. 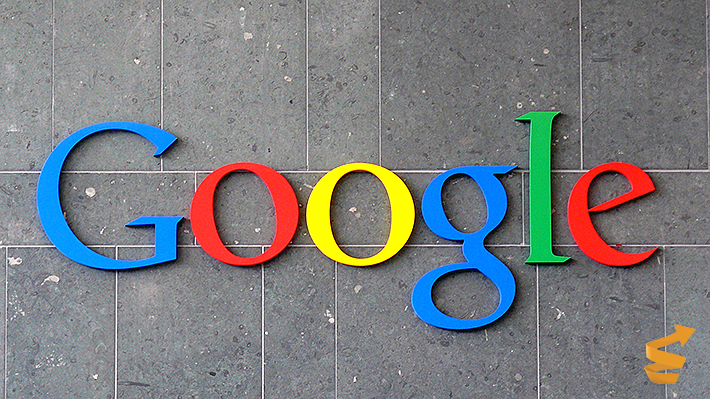 In Q4 2011, Google made revenue of over $10 billion!!! Google’s market capitalization amounts to $200 billion. This giant can cope with any crises and problems and this is the reason why all want to buy its stock. Although every business has its ups and downs and Google is not an exception but this company always overcomes any difficulties and keeps growing. The company has been listed on NASDAQ since 2004. Google stock is traded under the ticker GOOG. Google has shares of two types: common A- class stock in the amount of 33.6 million traded on NASDAQ, and preferred B-class stock in the amount of 237.6 million owned only the staff of the company. How to Buy Google Stock? The most affordable and almost the only way is to buy Google stock from a broker on the stock exchange. There are other ways to get this stock, for example, to become an employee of the company or buy it directly but in this case you need to be a billionaire. Below, I will tell you how you can buy Google stock at $25 for a period of 10 minutes to a month. If you buy stock from a broker on the stock exchange, it’s not difficult to do. You need to choose a broker, and yes, they are numerous. The most important point is that the broker has to provide stock brokerage service to individuals on the U.S. stock markets including the NYSE, NASDAQ, AMEX. If you have questions, you call a broker. You can ask even foolish questions from your point of view, and these companies always give a detailed answer, they don’t say that you should find this information somewhere on the website. After you make a contract with a broker (it takes a lot a time because you need to come to the broker’s office, make an appointment and explain its goal, fill in online forms and submit them, have a passport and sign a block of papers to open an account, and I advise you to ask the broker to send all copies to you), you need to top up your account by means of wire transfer. Then you need to install a trading terminal on your PC. The trading terminal is special software to sell and buy stocks allowing you to follow your revenue and quotes. Brokers offer different trading terminals but they are similar. There are two options of buying stocks. You can do it using terminal or call a broker. When you call a broker, you tell him your contract number, password, what and at what price you want to sell or buy. Typically, reputable brokers provide clients with several options of buying and selling. This depends on your preferences. I advise you to explain your broker what exactly you need. The broker can offer the best contract that suits your needs. You can visit Google Finance and google the stock GOOG. In this way, you can get prices, volumes, a chart etc. There is an interesting way of making a profit on Google stock. Instead of stock, you can buy binary options on it! (I wrote about binary options here, read it). 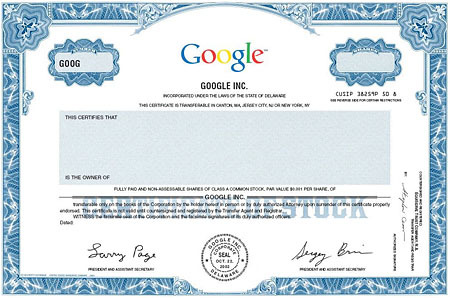 If you buy a binary option on Google stock, you have to pay just $25! A minimum period for which you invest is just 30 minutes! To buy options on Google stock, I advise you to deal with 24option. This is the first binary option broker regulated by the EU financial institutions, banks etc. All you need to do is to select Google stock from the list and figure out what direction the price will take. Trading stock of such a giant as Google, I advise you to expect the quotes to rise. After expiration (10-30 minutes, an hour, day, week or month), you will get a 73% profit if the price rises even by 0.001 from the moment of an option purchase. This is a kind of high-yield investment before which you pinpoint whether the price will rise or fall. Before you buy an option, you need to select time of expiration and whether the price will rise or fall. You know what profit you will make from the very beginning. 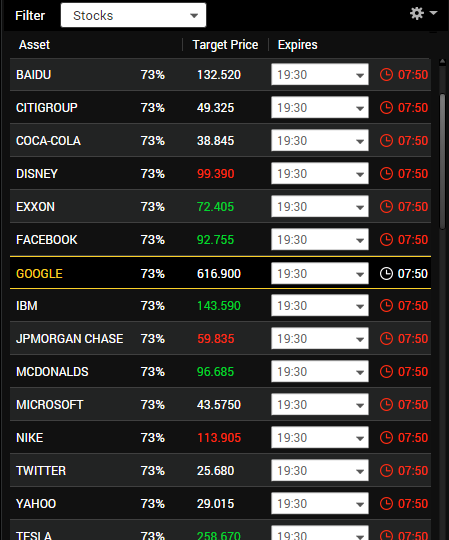 If you want to buy Google stock, you need to have in mind that you can do this during American trading hours, that is, 9:30 a.m. to 4:00 p.m. New York time. This is the way I make $51.1 or 73% on my investment in just 18 minutes! Based on the factors, I’ve made a conclusion that to buy stock of large companies like Google is worth from American brokers (in this case you don’t pay some taxes) and only if you have huge capital. Personally I think that if you have capital of $1,000 to $20,000, you should invest in options because of such pluses as a low minimum deposit requirement, short investment period, and very high yield (73% in 10-30 minutes, an hour or day). It takes only 3 minutes to buy an option and half a minute to sign up at 24option, and then even a kid can cope with it.